ETrace is job scheduling software: a web based BOOKING (scheduling), TRACKING and REPORTING system for service related businesses. With just a basic P.C. connected to the web, you and your staff can be up and running in no time. It's so simple, it makes sense . Take our video tour now . If you are a one person operation or have a staff of 15, ETrace's job scheduling software can SAVE you TIME, MONEY AND FRUSTRATION (see save money section) . Many repetitive functions that would normally take you minutes will now be done in a single click or two (see job scheduling software overview section). With eTrace access all your office information 24/7 anywhere you have internet access at home, office , on the road or from your vacation spot. See 4 different windows at the same time e.g. 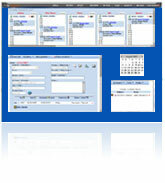 your complete days appointments and a customer's file and your search engine and this month's calendar . It's VISUAL , FAST and CONVENIENT. 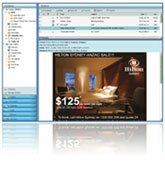 Communicate back and forth between any related business party or your staff , sub-contractors or client . All notes stay attached to the customer file . No need for a separate e-mail account . 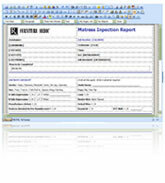 Each type of business has its own reporting and work-order formats. ETrace allows you to create your own forms . You can have many different styles for your different job types. Q : I have no computer skills, is this job scheduling software for me? A : Yes. This system was originally designed for an operator who had no computer or typing skills. If you can get on to the internet you have the basic skills needed to operate our system. Q : Can I stop this service at any time? A : Yes, Simply email or fax us your request to cancel and you will be immediately made inactive and we will stop charging your account. All of your files will be kept for 6 months from date of cancellation and then deleted. Q : I work alone and have no employees. Is there good value in this system for me?